You could have played GameCube (and Wii) game The Legend of Zelda: Twilight Princess with a very rare video game controller feature: a belt buckle. This is the never-produced Legend of Zelda controller from Nubytech. Nubytech is the company that made unusual products like the infamous Resident Evil 4 chainsaw controller and a Shadow the Hedgehog-themed gamepad for the PlayStation 2. 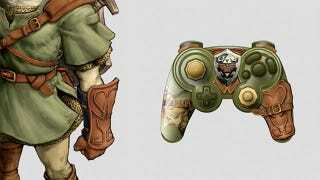 At one point, it seems they were planning on making a GameCube controller that dressed like Zelda savior Link. Based on shots of the prototype, it would have featured a leathery vambrace and a Hylian shield, with Twilight Princess artwork to remind players why they bought the thing. Had The Legend of Zelda: Twilight Princess not been delayed in order to become a Wii launch game, we might have seen this little monster a long time ago. It may not be the most attractive—or seemingly useful—controller, but the big, bookish packaging for Nubytech's Zelda controller has an appeal of its own. Product designer Alfredo Tato has more images of the device at his Behance, as well as shots of his other Nubytech work.